Our World Heavyweight Championship match is non-sanctioned, meaning the Title can change hands, but the T.W.O. will not be held legally responsible if the champion or challenger are injured. 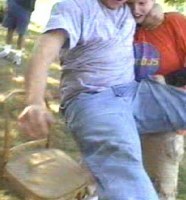 Our first bystander in this match is an old-fashioned chair at ringside, as Spaz slams Stryknieghn, breaking the chair and Stryknieghn's tailbone. Stryknieghn returns with a brutal DDT. Spaz slams the champ into the fence. 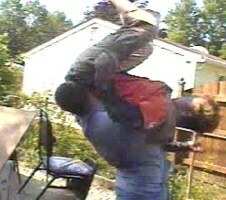 Spaz dropkicks Stryknieghn. The champ hoists Spaz in the air. Spaz is powerbombed through a makeshift table from hell! After pinning the challenger and winning the match, Stryknieghn isn't done. Knowing there will be no repercussions, Stryknieghn launches the challenger back toward the hellish structure, nearly breaking Spaz in half. 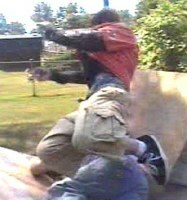 Spaz awakens with a vengeance, slamming Stryknieghn onto the remnants of the table then jumping on him. Don't be surprised if this feud isn't over.